Once I started writing my latest article for Berkeleyside’s Nosh, I became fascinated with the colorful history of brunch and brunch cocktails. I may have gotten a little carried away, but that’s what editors are for. However, I really wanted to share a couple of things that were left on the virtual cutting room floor. To make a pitcher of Bloody Marys (any smaller amount is worthless) take a good sized pitcher and put in it as big a lump of ice as it will hold. (This to prevent too rapid melting and watering of our product.) Mix a pint of good Russian vodka and an equal amount of chilled tomato juice. Add a tablespoon full of Worcestershire sauce. Lea and Perrins is usual but you can use A1 or any good beef-steak sauce. Stirr (sic). Then add a jigger of fresh-squeezed lime juice. Stir. Then add small amounts of celery salt, cayenne pepper, black pepper. Keep on stirring and taste to see how it is doing. If you get it too powerful, weaken with more tomato juice. If it lacks authority add more vodka. 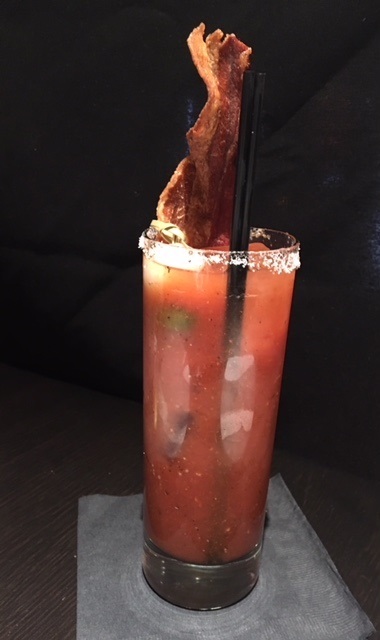 This one, the Bloody Hell Mary from Honor Kitchen & Cocktails does not lack authority. No indeed. Hi Risa! I am thoroughly enjoying exploring your website. Your awesome writing just shines as it entertains and inspires! Thank you for sharing your talent with the world. Hemingway ‘s Bloody Mary recipe is fun, as was the history of brunch. I will be reading more, but wanted to “paws” ( reference to Bree’s blog) and let you know what a delight it is to discover your treasures. And, I would recommend your grrr-eat (Bree in my head) books to anyone and everyone! You are an angel, and I appreciate your lovely words and loving spirit! Hi Jeanine! Thanks for your kind words! Glad you are enjoying the writing.